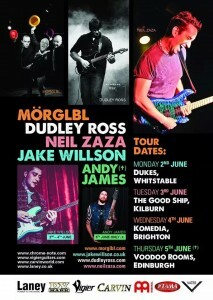 Hi everybody I will rock the U.K with MÖRGLBL and an amazing package of great guitar players!!! Christophe GODIN, Neil ZAZA, Dudley ROSS, Jake WILLSON, Andy JAMES. Don’t miss it if you are around.